The cordless stick vacuum is one of the vacuums that are trending on the market. Consider a vacuum that combines some of the most desirable qualities in a vacuum: the lightweight convenience of a handheld vacuum, the power of an upright vacuum, the ease of use without having to plug into an electrical outlet, and you get the idea why the cordless stick vacuum has become so popular these days. Before you jump into buying a cordless stick vacuum right away, you should first consider whether the cordless stick vacuum will meet your needs. As we alluded to earlier, cordless stick vacuums offer you the best of both worlds with a conveniently portable vacuum that has more cleaning coverage than a handheld vacuum. This also means that a cordless stick vacuum is typically larger and heavier than a handheld vacuum. Handheld vacuums are great for cleaning your furniture and small surface areas. However, when it comes to vacuuming larger surface areas like your floors and reaching under your furniture, a cordless stick vacuum will make your life easier. Don’t even think about vacuuming your floor with a hand vacuum; it will take hours and more! Next, we come to upright vacuums. Upright vacuums are heavier and bulkier than cordless stick vacuums. You will probably find it more cumbersome to use an upright vacuum while cleaning staircases. A larger size also means that you will need more storage room to put away an upright vacuum. Cordless stick vacuums, on the other hand, require less space and are also much easier to maneuver up and down the stairs. That said, keep in mind that upright vacuums typically have higher suction power to get rid of dirt and debris more effectively and efficiently. As for the cordless feature, the best cordless stick vacuums offer decent battery time, which would make up for the hassle of having to recharge the battery when the vacuum runs out of juice. If you don’t have large looming halls to clean, the best cordless stick vacuum should do the job. Now that you have settled on getting a cordless stick vacuum, it’s time to decide which model would be suitable for you. There are many options out there, so your best bet would be to check out the cordless stick vacuum reviews to see which one would best fit your needs. To help you out, we’ve listed some factors that we thought would be useful when you are trying to choose the best cordless stick vacuum. Of course, besides these qualities, you should also be considering if the price is right for you. The best cordless stick vacuum is ultimately one that best fits your requirements, which should include your budget, among many other considerations. By now, we all know that that one of the biggest drawbacks to a cordless stick vacuum is that its usage time is limited by its battery power. On the one hand, a battery-operated stick vacuum gives the vacuum the desirable quality of portability and convenience. On the other hand, this advantage comes at a price: even the best cordless stick vacuum needs to be recharged once it runs out of juice, which means waiting time before you can put it to use again. On that note, it is a no-brainer that battery matters for all cordless stick vacuums. The best cordless stick vacuum 2019 uses lithium-ion batteries. Compared to other batteries like the nickel-metal hydride batteries, lithium-ion batteries usually have larger battery capacities. Without going into the specific scientific details, a battery that has a larger capacity can operate for a longer period of time per charge as compared to a battery that has a smaller capacity. Lithium-ion batteries are lighter than nickel-metal hydride batteries, which is another bonus point for a lightweight cordless stick vacuum. Another advantage of lithium-ion batteries is their ability to hold a charge; as long as you keep them in the charging docks when they are not in use. Lithium-ion batteries are also known to last for two to three years before they need to be replaced. In our article today, the five best cordless stick vacuums 2019 featured are all powered by lithium-ion batteries. Now we know that suction power is an important factor that you should consider too. In fact, suction power is probably one of the main considerations when comparing and deciding on the best vacuums, cordless stick vacuum or not. Suction power determines how many passes it takes for the vacuum cleaner to remove debris and how powerful it is when it comes to vacuuming different surfaces. Since we are focusing on cordless stick vacuums, you should also take note of how long the battery life can last on different power modes. Some of the best cordless stick vacuums come with a high suction power or what is often termed as a “boost” mode, but that comes at a price: the battery power will be drained at a faster rate. In these cases, it is often useful if the cordless stick vacuum comes with a gradual indicator to let you know how much battery power is left, so that you are not caught unaware when the vacuum suddenly runs out of power. Generally, all cordless stick vacuums have similar designs. Think of a cordless stick vacuum as a broom: essentially a long stick with a vacuum head. As mentioned, cordless stick vacuums are designed with portability in mind, so they should be fairly easy to transport around. The heaviest cordless stick vacuums probably weigh no more than 12lbs and the lightest cordless stick vacuums can be as light as 3lbs. More sophisticated cordless stick vacuums come with swivel heads that can rotate up to 180 degrees. This feature can come in handy when you are maneuvering the vacuum around the house, especially when it comes to negotiating corners and changing directions. If space is a concern for you, you will be pleased to know that some of the best cordless stick vacuums can be folded and tucked away easily without taking up much space. As with most other vacuums, the cordless stick vacuum comes with a dust bin or a dust bag that accumulates the dust and debris collected. When choosing the best cordless stick vacuum for your needs, you should also consider the size of the dust bin or dust bag and whether HEPA filtration is an important feature for you. A vacuum with HEPA certification would be able to remove close to 100 percent of the allergens in the air. Between a dust bin or a dust bag, there are pros and cons for either. With a dust bag, you don’t have the problem of dust scattering as compared to a dust bin during removal. On the flip side, however, a cordless stick vacuum that comes with a dust bag means that you have to replace the dust bags periodically and this adds to the maintenance cost of the vacuum. Some of the more sophisticated cordless stick vacuums that are equipped with dust bins come with nifty functions like a bin that makes for easy emptying of the canister. Having other accessories or attachments can come in handy. These are not a must, but they can be a bonus factor when you need to decide between two cordless stick vacuums with similar pricing. The standard attachments for a cordless stick vacuum are the crevice tool and the dusting brush to dust upholstery and furniture. Any other attachments would be considered a plus. Now that we have a better idea of cordless stick vacuums and what to look out for when choosing one, it’s time to take a look at the best cordless stick vacuum 2019. We have rounded up cordless stick vacuum reviews to come up with our top five best cordless stick vacuums below. If you are familiar with Dyson, you may have probably read multiple great reviews about the Dyson V6 Absolute. The Dyson V8 absolute is a slightly more advanced version of the V6—its digital motor has purportedly been improved to provide 150% more brush bar power than its predecessor. As the latest Dyson toy on the market, this cordless stick vacuum comes with a hefty price tag that’s within the $500-$600 price range, which is why we have classified this as a luxury option. The Dyson V8 Absolute uses the signature two-tier radical cyclone design to increase air flow and trap fine dust particles. Its motor can spin at 110,000 rpm, which is pretty amazing. Another plus point is that this cordless stick vacuum is able to clean both hard floors as well as carpeted floors, which is a great deal if your house has both floorings. Its brush features and impressive suction power also makes this cordless stick vacuum a cleaning powerhouse. At 5lbs, the Dyson V8 Absolute is pretty light. Many customers have commented that the center of gravity of this cordless stick vacuum is near its handle, which increases its manoeuvrability. The Dyson V8 Absolute also requires minimum storage space is required if you use the wall-mounted docking station that comes with the vacuum. 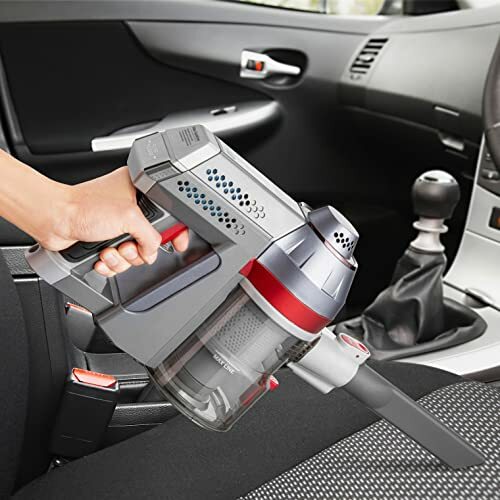 Like all Dyson cordless vacuums, the Dyson V8 Absolute can be easily transformed into a handheld vacuum for those quick cleaning tasks. The dust bin is a little small at about 0.14 gallons, which means you will have to empty it more frequently. That said, the Dyson V8 Absolute has a great push-button design so you don’t have to get your hands dirty when ejecting the dust that has accumulated in the bin. For those with allergies, you will also be pleased to know that this cordless stick vacuum is equipped with HEPA filtration to trap allergens. The vacuum also comes with a two-year limited warranty, which is pretty standard for most cordless vacuums. Based on cordless stick vacuum reviews of the Dyson V8 Absolute, it seems that the batteries can last for about 20 to 25 minutes with a motorized power head attached. In boost mode, this vacuum is said to last for about six minutes. This is probably the main complaint that most customers have when it comes to this cordless stick vacuum. Overall, the Dyson V8 Absolute is a great buy if you are willing to make the investment on a cordless stick vacuum to assist you with effective and fast cleaning at home. If you don’t have that much cash to spare, the Dyson V6 absolute is now going for just under affordable price with many similar features to the Dyson V8, so that can be a good alternative. The Shark Ionflex 2X Cordless Stick Vacuum could be your best choice for 2019. This cordless stick vacuum doesn’t come cheap. However, you won’t be disappointed by its excellent features. The Shark Ionflex 2X comes with two rechargeable lithium-ion batteries and a charging dock, so you can always charge while you clean and experience minimal interruption when you go about cleaning the house. Its MultiFLEX technology also enables you to park the cordless stick vacuum wherever you want. Speaking of other tools, the Shark Ionflex comes with a bristle brush that helps you clean deeply embedded dirt in your carpets and another soft brush roll that helps to trap larger particles and clean up hard floors for a polished look. This cordless stick vacuum can also transform into different modes of cleaning: upright when you need to clean floor surfaces, reach when you need to bend the stick to access hard-to-reach spots, and as a handheld vacuum for above-the-floor cleaning when it comes to corners and shelves. According to cordless stick vacuum reviews, this cordless stick vacuum can last for about 30 minutes when cleaning carpeted areas on a fully-charged battery. For its steeper price tag, the Shark Ionflex 2X Cordless Stick Vacuum also comes with a longer warranty period: five years for the vacuum and two years for the battery pack. If you have the budget for a higher-end vacuum, we think that the Shark Ionflex 2X Cordless Stick Vacuum might just be the best choice for a good cordless stick vacuum 2019. Amazon is having a discount for this vacuum right now, so you might want to check it out before the offer runs out! At just 4.7lbs, this Deik 2 in 1 Cordless Vacuum Cleaner is incredibly lightweight. While that means it packs less of a punch, it still provides impressive suction power at 7Kpa. What is special about this cordless stick vacuum is that it can transform into a handheld vacuum with a push of a button. Other interesting features include its illuminated floor head to help you see where the dirt is and clean without missing a spot. This cordless stick vacuum is also equipped with multi-floor cleaning capabilities so you can transition from carpeted floors to hard floors without breaking a sweat. You just need to push a button to turn off the rolling brush so that you can safely handle hard surfaces. Other handy tools that come with this cordless stick vacuum include a crevice tool and a stiff brush for cleaning your car, furniture, or other hard-to-reach areas at home. Other amazing features about this cordless stick vacuum? The Deik comes with a HEPA filtration system so the vacuum is able to trap fine particles and prevent the spread of allergies and bacteria in your home. The Deik takes about 4.5 hours to charge fully and can provide about 20 minutes run time on a fully charged battery. This cordless stick vacuum also comes with a 12-month warranty for your peace of mind. At a reasonable price, we think that the Deik is a steal for its many awesome features. While the Deik may not have as many cordless stick vacuum reviews as the Hoover Linx Cordless Stick Vacuum, we think that this is probably because the Deik is relatively new. Comparing both cordless stick vacuums, we would say that both are good budget options that you should consider. The Hoover Linx Cordless Stick Vacuum has been around for a while, but it is still a hot favorite among many users. Just look at the number of cordless stick vacuum reviews this product has on Amazon and you will understand what we are saying! For under $200 (or slightly above $100 with Amazon’s current promotion), you can get a top quality cordless stick vacuum. Now that’s a great deal! With its 12-amp motor and Hoover’s proprietary WindTunnel® 3 Technology, the Hoover Cordless Stick Vacuum is well-equipped to get rid of deeply embedded dirt. This cordless stick vacuum also has a multi-floor cleaning feature, so it can handle both carpeted and bare floors. With its edge cleaning bristles, this cordless stick vacuum makes it easier to clean hard-to-reach areas like corners and wall edges. Another well-liked feature is the Hoover Cordless Stick Vacuum’s low-profile base. This means that the vacuum can fit easily under counter edges and furniture, which can come in handy if you have limited storage space at home. At 12lbs, this is one of the heavier cordless stick vacuums, but it is still very light if you consider other heavy-duty vacuums like the upright and cannister vacuums. Based on the cordless stick vacuum reviews we’ve read, the weight of the vacuum hasn’t been an issue for anyone. Many customers love the Hoover Linx Cordless Stick Vacuum for its long battery life and the battery indicator that allows you to gauge when you need to recharge the battery. The fade-free feature of its battery means that this cordless stick vacuum will not lose its suction power even as the battery power drains. The vacuum is bagless so you can save on the money to replace dirt bags. The Hoover Linx Cordless Stick Vacuum’s dirt cup is designed with a bottom release which reduces the hassle when you are cleaning up. The vacuum comes with a two-year limited warranty and you can also buy an additional battery. With so many raving reviews and a great price tag, the Hoover Linx Cordless Stick Vacuum is definitely one of our favorites in our list of the best cordless stick vacuums 2019. Moving up the price chart, we have the Black+Decker HSVJ520JMBF27 cordless stick vacuum. At a slightly higher price tag that’s closer to the $150-$200 category, this is a good mid-tier option if you are into fancier features like the Black+Decker’s proprietary AutosenseTM and FiltersenseTM technologies. The AutosenseTM technology enables this cordless stick vacuum to automatically adjust its suction power when you move the vacuum from bare floors to high pile carpeted areas. With FiltersenseTM, this cordless stick vacuum displays an indication light when the filters need to be cleaned. Like the Hoover, the Black+Decker also provides an indication of the battery charge with its BatterysenseTM technology. With the Black+Decker, you will also be getting two vacuums in one: a cordless stick and a cordless handheld when converted. At 9lbs, this is also a lightweight vacuum that you can easily manage when you go about cleaning the house. What’s more, Black+Decker claims that this vacuum can vacuum your entire house on one single charge, based on their test in a 2,500 square feet home. This cordless stick vacuum has also been put to the test to clean up a cup of Cheerios in one single pass. Judging from the cordless stick vacuum reviews, Black+Decker’s claims seem to hold up—many customers have written in to praise this vacuum for its suction power. The vacuum also comes with a two-year limited warranty. This vacuum is a great mid-tier option if you are willing to splurge a little to get the best cordless stick vacuum 2019. So, there we have it—our top five best cordless stick vacuums for 2019! For more vacuum reviews, be sure to check out our other articles!